aUsing authentic materials and designs, we have made a place where you can experience cooking as it would have been done in 1802. Many of the items baked are based on recipes taken from historical accounts: puddings,cakes, biscuits (cookies to Americans), breads, many meats and vegetables. 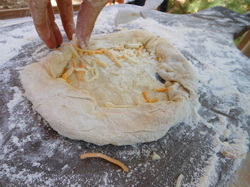 Other delicious baked goods such as onion pie and sweet rolls have also been made. Schoolkids that come for field trips have really enjoyed our flat bread made in the hot oven (675 degrees). 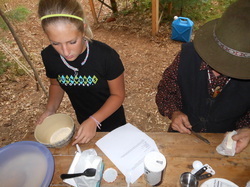 Re-enactors are finding that they can make a lot of "eats" they would normally not attempt. 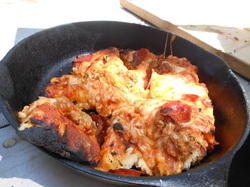 One of our meals is making your own pizzas. The kids make their own from scratch and then get to eat them. 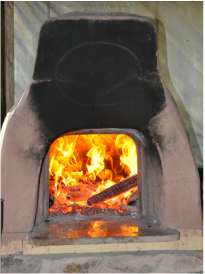 The Clay Ovens will be fired during Daagwaggin on October 7th. You can enjoy samples of breads and other goodies baked in the oven that day. 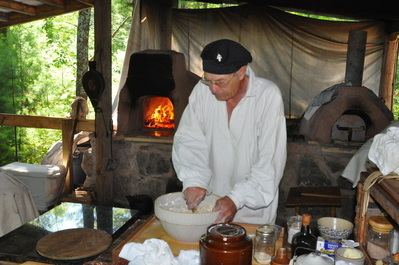 Would your group like to experience Quebec style oven baking? You can reserve the ovens and have your own bakeoff or pizza party for your group.